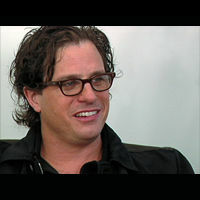 IndependentFilm.com|VIDEO: Davis Guggenheim and his use of the JVC HD100 in "An Inconvenient Truth"
home > technology > technology video > video: davis guggenheim and his use of the jvc hd100 in "an inconvenient truth"
VIDEO: Davis Guggenheim and his use of the JVC HD100 in "An Inconvenient Truth"
Davis won the 2007 Academy Award for Best Documentary Feature about Al Gore's slide-show presentation on the global warming crisis. Davis talks about how he shot about 1/3 of his award winning documentary with the JVC HD100. Davis Guggenheim a recent Oscar winner for his documentary about Al Gore and Global Warming talks about his use of the JVC gy-HD100u in his film. Here is a link to a JVC ProHD user forum. This forum is filled with lots of users and sometimes folks from JVC. It's the best on the web. Each of the big camera companies has positioned their cameras a little differently against each other. (Panasonic, JVC, Sony, Canon, and now Red) The key is to find out which features you like, and ultimately which look, camera design, camera weight, available accessories, workflow, and format, you like.